This pretty and feminine shrug is worked in a lace pattern that edges each armhole then travels across the back in openwork ladders. 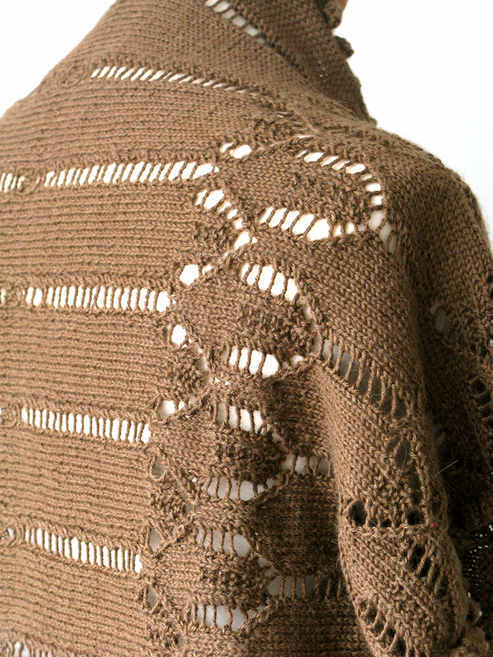 The shrug, knitted in 4ply Baby Alpaca & silk begins with a bobble edge cast on and is then worked in 2 pieces which are grafted together at the centre back. 600 (800 ; 800 ; 800) m [656 (874 ; 874 ; 874) yds] of 4ply weight yarn. Shown in 70% Baby Alpaca / 30% Silk 4ply blend ~ 200m per 50g (281 yards per 1 ¾ oz).